If you think a high performance, high quality vehicle has to cost and arm and a leg, it's time to think again. Design your perfect ride from ten available models of the all new Ford Focus. Choose from a sedan, hatchback, fully electric or limited edition Focus RS, all available in thirteen eye-catching colors sure to stand out in West Covina. Pamper yourself and your passengers with heated seats and dual climate control zones that put comfort first. 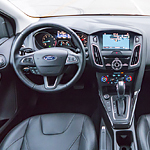 Enjoy a host of smart safety features including but not limited to Ford's patented Blind Spot Information Technology and Active park assist. You can even add a moon-roof for stargazing on clear winter nights. At a starting price of just $29,990, the new Focus seamlessly marries style and affordability. Come see visit your Ford of West Covina showroom today and let our expert staff answer all your questions and schedule a test drive.